Friday nights just got a whole lot more interesting! 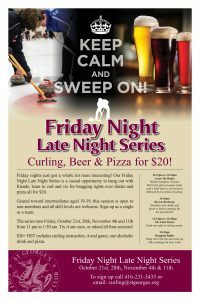 Our Friday Night Late Night Series is a casual opportunity to hang out with friends, learn to curl and vie for bragging rights over drinks and pizza all for $20. Geared toward intermediates aged 19-39, this session is open to members and non-members and all skill levels are welcome. Sign-up as a single or a team. The series runs Friday, October 21st, 28th, November 4th and 11th from 11 p.m. to 1:30 a.m. Try it out once, or attend all four sessions! World Champion, Graeme McCarrel, gets you game ready with a brief learn to curl session, followed by two ends of curling. Socialize over drinks and pizza or build a strategy for the second half. Final two ends of curling action. Hang out in the bar and come up with a strategy for next week. Includes curling instruction, 4-end game, one alcoholic drink and pizza. Know anyone that may be interested?